When I learned that Lisa See had a new novel out, I ran out and bought it as soon as I could. With the exception of Peony in Love, which I wasn’t crazy about, I’ve loved everything else I’ve read by Lisa See. China Dolls does not disappoint. 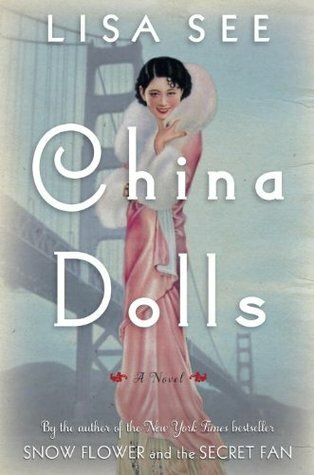 The novel opens with seventeen-year old Grace’s arrival in San Francisco in 1938. Raised in a small midwestern town in Iowa, Grace is Chinese by blood, although she’s never laid eyes on another Oriental in her life. Running away from a father who beats her ruthlessly, Grace is determined to make it in San Francisco as a dancer. Her path soon intersects with those of two other Oriental girls: Helen, the only daughter of a well-to-do Chinese family who live in their compound in the heart of Chinatown, and Ruby, a free spirit who cares nothing for convention or rules. All three young women have secrets; all three are running from something and trying to carve out new lives for themselves on the stage. Entertainers the likes of chorus girls are largely seen as immoral and one step up from prostitutes in post-Depression era America, and Grace, Ruby, and Helen must all deal with the social and familial repercussions of their choices. On the brink of WWII, the air is charged with excitement and distrust, and an act of betrayal changes the course of the girls’ lives for good. It’s easy to go into this novel thinking it’s going to be about the unbreakable bond of friendship that verges on sisterhood between these three women, but it would be a mistake to think it’s that simple. As in real life, the bonds of friendship are tested and scarred by jealousy, competition, backstabbing, spite, shifting loyalties, and shifting fortunes. See does a beautiful job of creating believable, vivid characters in a plot that takes a number of twists and turns. Narrated by turns by Grace, Helen, and Ruby, the reader gets inside each character’s head, and is transported to a different time and place; I was fascinated by this slice of American history involving Chinese American stage that I knew nothing about before reading China Dolls. I couldn’t put this one down; loved it. HI! I’ve been following your blog for a few months now and I just want to let you know I LOVE it! I enjoy seeing what you like and don’t like and–probably because we have similar tastes–when you like something, I try to pick it up. I’m reading Donna Tart (sp?) “The Goldfinch” right now and can’t wait to start this new one by Lisa See (I loved “Snowflower”). Keep it up and know that I am very happy to read your blog! I can’t WAIT to read this one! I am on a long waiting list from the library….. while waiting, I am reading “On Gold Mountain” by Lisa See… its pretty good so far. More biographical. I love reading your book reviews!